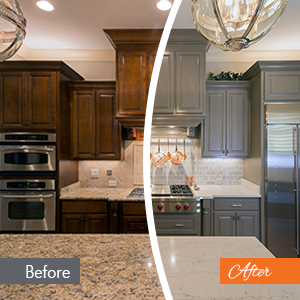 Are you looking to update your kitchen cabinets and add a little color to your home? N-Hance® custom kitchen cabinet finishes are the perfect solution. A custom color finish will give your cabinets a brand-new look at a fraction of the cost of a remodel or redesign. N-Hance’s custom kitchen cabinet finishes are available with limitless color options and can give your kitchen a new look in a matter of days. N-Hance offers a line of Custom Colors for our kitchen cabinet finishes, giving you total creative control over the color of your cabinets. Your custom finish will allow your personality to shine through, whether you choose a white finish, a subtle shade of gray, or brightly colored cabinets in your favorite tint or shade. Not sure of the color you want? Our team can help! Your local N-Hance will take you step-by-step through the custom finish process, providing you with color samples and giving tips on how to choose the perfect finish. Why Choose Custom Kitchen Cabinet Finishes? N-Hance’s custom kitchen cabinet finishes offer something different from typical kitchen cabinet painting contractors. While most cabinet painters will simply apply a couple of layers of paint and call it a day, we take a far more thorough approach. N-Hance’s kitchen cabinet painters will first thoroughly clean and prime the cabinets, which makes the surface more adhesive. We will then apply the color of your choice and top coat, providing the utmost durability. After that, we use our Lightspeed® system to instantly cure the kitchen cabinet finish. Thanks to Lightspeed, it takes us just a few days to complete a custom finish, with less wait-time and fewer VOCs than traditional cabinet painting methods. With N-Hance Custom Colors, you can dramatically change the style of your kitchen, bathroom, or business in just 3 to 5 days. We offer a far greater selection of colors than most other cabinet painting companies, giving you the freedom to fully express yourself with a complete range of tones, tints, and shades. You can choose from hundreds of color combinations, making it easy to find the perfect match for your kitchen as well as your personal style. N-Hance custom kitchen cabinet finishes are also budget-friendly! A custom finish is 1/3rd the cost of refacing your cabinets and 1/5th the cost of replacing them. By updating your cabinets with N-Hance Custom Colors, you stretch your kitchen remodeling budget while achieving the style you’ve always wanted. Call your local N-Hance at (855) 642-6230 for more information about our custom kitchen cabinet finishes and get a FREE estimate!